The NEW Woodbridge Plus 10 x 10 Vinyl Storage Shed is in our plus signature line that gives you the ultimate solution for all your storage needs. If you have the room this is the ideal storage for you. With large cubic feet, there is no better valued vinyl storage shed in the market place today. This tall walk-in shed features tall and wide double doors. The wall columns are reinforced with a solid metal structure that gives the shed strength as well as allows you to mount shelves or hang garden tools. These larger sheds can also be used as a hobby or activity room. 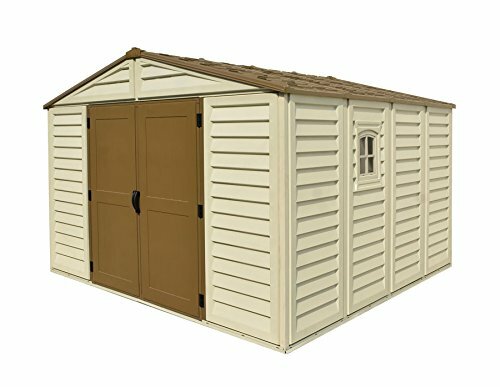 Woodbridge Plus 10 x 10 Vinyl Storage Shed Features: Size: 10 ft. W x 10 ft. D x 6 ft. H 775 cu. ft. Exterior dimensions (roof edge to edge): 126.6 in. W x 125.3 in. D x 85.4 in. H Interior dimensions (wall to wall): 124 in. W x 124 in. D x 73 in. H Wide lockable double doors: 61 in. W x 71.5 in. H Panel height: 73 in. Size: 10 ft. x 8 ft. Exterior dimensions: 127.9 in. W x 97.2 in. D x 91.8 in. H Interior height: 73 in. Door dimensions: 60.6 in. W x 71.4 in. H Shipping weight: 431 lbs. Wide double doors 1 side window Foundation Kit Designer roof shingles Roof truss & wall columns are reinforced with metal Includes door handles with padlock eyes All-weather durable vinyl Won't rust, rot, dent or mildew Never needs painting Snap-in panel/column for easy assembly (two people) Passes wind tests (when anchored to the ground) Strong Roof & Side Metal Frame Support Structure Assembly Made Easy The assembly is simple, clean, safe and can be completed in four to five hours with two people. All parts are pre-cut, drilled and numbered for ease of assembly. All you need to provide is a level surface of either wood, or concrete, the size of the desired building. In addition you will need a power drill, hammer, measuring tape, pliers and a ladder. If you have any questions about this product by Duramax, contact us by completing and submitting the form below. If you are looking for a specif part number, please include it with your message.